(Seychelles News Agency) - Around 8 percent of residents in Seychelles are expected to benefit from the energy produced by a new solar panel farm to be built on Ile de Romainville, the Public Utilities Corporation says. The five-megawatt solar panel plant will cover around 75 percent of the ground available on the reclaimed island close to the capital, Victoria. The new solar installation will push the island nation farther down the renewable energy path. The 115-island archipelago already has a wind farm consisting of three wind turbines on Ile du Port and five on Ile de Romainville. 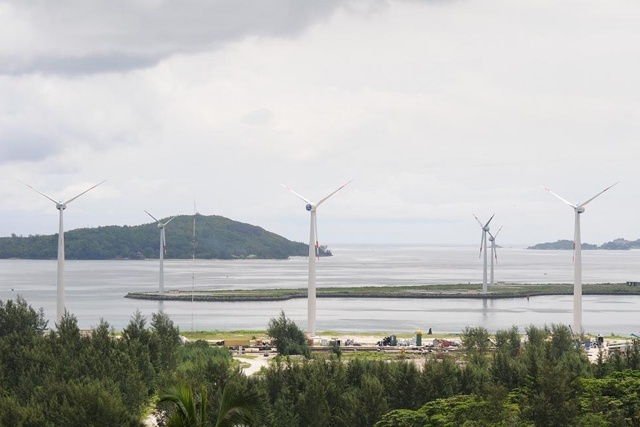 The six-megawatt farm produces around 2.5 percent of Seychelles' energy requirements. Seychelles, which is located in the western Indian Ocean, received $8.5 million from the International Renewable Energy Agency (IRENA) and Abu Dhabi Fund for Development (ADFD) for the new solar project. PUC’s chief executive, Philip Morin, said that Ile de Romainville was chosen because of its flat surface, which exposes the panels to the sun. “Romainville is very close to the power station making it easy to inject the energy produced directly into the grid,” said Morin. With this new project, PUC will save around $1 million per year, as less fossil fuel will be used in the production of electricity. The plant will also help Seychelles reach its goals under the Paris Agreement of 2015 by reducing the emission of carbon dioxide. “The saving that we are going to make will be invested in the utility infrastructure in the country [though] it will not directly translate to a reduction in electricity prices,” said Morin. The project is expected to become a reality by the end of 2017 or early next year and PUC plans to install more solar panels on Ile de Romainville under a grant from the Indian government. An energy policy 2010-2030 is in place and being used a guide towards reducing consumption of fossil fuels by 15 percent in 2030. Seychelles already has in place a renewable energy rebate scheme from the government to encourage inhabitants to invest in photovoltaic solar panels for residential homes and businesses.